In the event of large disasters, such as this destructive fire, a rapid assessment of the damage is necessary to grasp the severity and extent of hard-hit areas. Responders and analysts need to easily understand and identify the scope of damaged regions and quickly create visualizations that contain useful geospatial information, reflecting conditions on the ground, in order to direct rescue team efforts. Given limited time and resources, assessing the immediate risk of damage to people and property needs to be quickly and accurately. GIS and geospatial imagery are excellent resources for effectively managing fire damage assessment activities. To assess the damage over large geographic areas, recent satellite imagery or aerial photography can be used to gain an overall understanding of the landscape. Additionally, a general idea of the magnitude of damage can be identified from geospatial data. The overall fire area can be readily identified from satellite imagery and points on the ground, then the general boundaries can be overlaid onto a map. The power of image analysis tools can be used, even on PDF maps, to help derive new geospatial information for fire personnel, capturing the extent of fire damage or the amount of burn scarring, for example. This type of information can be extracted from imagery and used analytically in conjunction with existing datasets in a GIS framework. 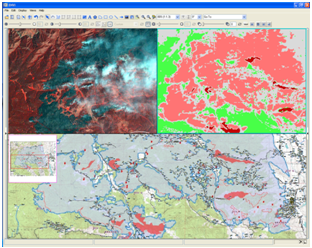 A PDF map image, like the one shown above, can be viewed and processed, allowing for the isolation the fire burn regions, location of hotspots, and quantification of burn extents, or as a new data layer for further analysis. Geospatial analysis results often provide critical, time-sensitive information that can be used to update a geodatabase or to create a map for dissemination to emergency workers on the ground. After the fire has been extinguished there is still a lot of work to be done, reconstruction and damage mitigation – tearing down and rebuilding structures, removing debris, controlling for post-fire erosion conditions, etc. – will all be time intensive tasks and that require a direct and efficient application of limited resources, which can also be support with GIS applications and geospatial imagery.